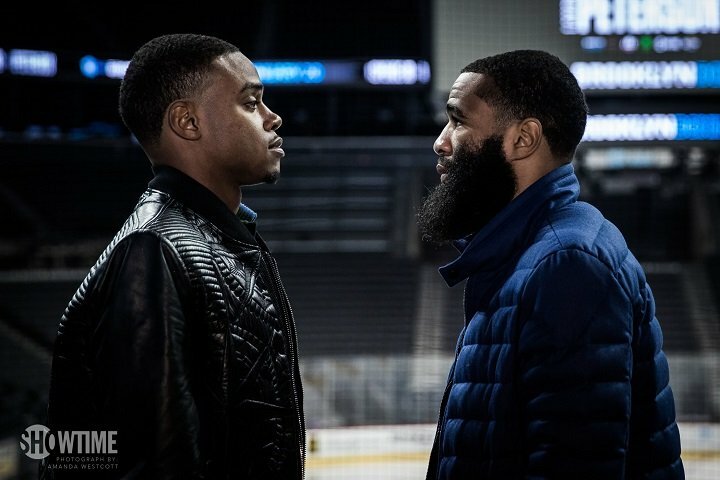 In a bout involving inactive fighters, IBF welterweight champion Errol Spence Jr. (22-0, 19 KOs) defends his belt this month against former 140lb champion Lamont Peterson (35-3-1, 17 KOs) on January 20 at the Barclays Center in Brooklyn, New York. This is a Showtime televised match-up. Peterson hasn’t fought in 11 months since his win over David Avanesyan last year in February. Spence has been out of action for 8 months. These are 2 fighters that are in the prime of their careers, but they’re not staying busy enough to get the most of their careers. Spence says he’s going to fight 3 times in 2018, but that remains to be seen. Spence is viewed as the best fighter in the 147lb division by a lot of boxing fans. That means he’s going to have a lot of weight on his shoulders when he steps inside the ring with the 33-year-old Peterson on January 20th. Spence can’t just beat Peterson. He must beat him and look impressive and win preferably by knockout. Spence, 27, won the IBF belt last May in stopping Kell Brook in the 11th round. That was a superior performance by Spence, who started out slowly, but then picked up steam in the second half of the fight and wore Brook down with power shots. An eye injury Brook sustained in round 6 led to him taking a knee in round 11 and not getting back up. Peterson isn’t viewed as a step up for Spence from the Brook fight, but you never know. Peterson is a much different type of fighter than Brook. He’s more willing to stand in the pocket and trade body shots with Spence, which should make the fight fun to watch. Peterson is coming off a 2-fight winning streak in beating David Avanesyan and Felix Diaz. He didn’t look particularly impressive in either of those bouts, but he did enough to win a par if 12 round decisions. Before that, Peterson was beaten by Danny Garcia by a 12 round majority decision on April 11, 2015. That was a winnable fight for Peterson, but he started pressuring Garcia a little too late in the fight. Peterson gave away the first 5 rounds. By the time he did start backing Garcia up and nailing him with body shots, he needed some knockdowns or a knockout to have a chance to win the fight. Carl Froch has a theory that Andre Ward gave up his light heavyweight titles late last year to get out of having to defend against his WBA challenger Dmitry Bivol (12-0, 10 KOs). Ward would have needed to defend against Bivol if he’d continued to hold onto his belts. Ward beat Sergey Kovalev twice in a row before hanging up his gloves. Those 2 fights showed that Ward still had a lot left in his game. Whether he would have enough to beat the 26-year-old Bivol would be a different story. Bivol is looking very strong right now, and some think he’s the future star for the division. HBO could make Bivol one of their mainstays like they’ve done with IBF/IBO/WBA/WBC middleweight champion Gennady Golovkin. “I have a feeling Bivol helped Andre Ward make his retirement decision and I don’t say it very often, but I’ve seen something in Bivol that I wouldn’t want to stand in front of,” said Froch to Sky Sports. “I think Dmitry Bivol is going to be great. He has a cool and calm demeanor and he oozes confidence, but not arrogant or nonchalant, he is just relaxed. He is so precise, so accurate with his work, he’s lethal. Put him in with Sergey Kovalev down the line and you will see how good he is,” said Froch. If Ward makes a comeback to the sport, he’ll have a chance to prove Froch wrong by taking on Bivol. That would be a great fight, as long as it’s not marred by low blows and/or controversial scoring like the two Ward vs. Kovalev fights.